No other Indian food has as many stories to tell as biryani does. Rosogolla surfaces to public notice once in a while due to the age-old contention over its origin between two neighboring states: Bengal and Odisha, while biryani is the only food to enjoy pan-India attention throughout the year. The stories of biryani are as varied as the taste and flavor of the dish across the country. If lots of conversation or discussion happens over tea in India, many incidents occur over biryani. Biryani is not just a delightful treat but a bribe, bait and gift. It puts smiles on withered cheeks, brings a ray of hope amidst adverse circumstances, pushes campaigns forward, stimulates arguments and unites people. IndianEagle curated the most interesting biryani stories from across India and abroad to make you understand the unbeatable power and popularity of biryani. Biryani is no compromise under any circumstance! It was evident from the disappointment of some people for being served sambar rice not biryani during the Chennai floods 2015. When a group of volunteers reached out with packets of sambar rice and other relief materials to the people stuck amidst flood waters, braving the pouring rain and shoulder-leveled standing water, they met with disappointment for not serving biryani. Paradise Biryani, a most popular Hyderabadi biryani brand, sent the dish for them. One of the interesting biryani stories is sourced from the Tamil film industry. Among Tamil film stars, Ajith is so fond of biryani that he loves cooking it for everyone on the shooting spot. He has cooked biryani for the filming crew multiple times. It bears out to not only his penchant for biryani but his simplicity and down to earth nature. Moved by Ajith’s unfathomable love for biryani, director Venkat Prabhu named his black comedy film ‘Biriyani” in 2013. Biriyani is a thriller which was filmed in Chennai and Hyderabad. The story of ‘cockroach biryani’ in Srinagar, the capital of Jammu and Kashmir, is among the most interesting Biryani stories in India. When a local dentist and his friends found cockroaches in the biryani served to them at a multi-cuisine restaurant at Hazratbal, one of the outlets owned by Hat Trick fast food manufacturer in Kashmir, they forced their way into the kitchen and found it unhygienic to their surprise. When the ‘cockroach biryani’ story went viral on social media, a group of young foodies launched a ‘Munna Bhai style’ campaign and sent 1000 ‘get well soon’ letters to the restaurant owner. The campaign caught attention of the Food Safety Department and led to sealing of the cockroach restaurant. One of the Hyderabadi biryani stories is related to Mahendra Singh Dhoni, who was captain of the Indian Cricket team in 2014. He along with his team vacated the 5 star Hotel Grand Kakatiya where 180 rooms were booked for the team and BCCI officials, and moved to Taj Krishna due to a fiasco over homemade Hyderabadi biryani. One of Dhoni’s teammates brought homemade biryani for the entire team, which Hotel Kakatiya refused to allow within the premises. Hyderabadi biryani is something exclusive to die for! The 59th National Shooting Championship held in Delhi in 2015 is a memorable event for mouthwatering biryani served to the participants. The shooters from all over India were served delicious biryani at a nominal cost. Nawabuddin is the man who cooked and served the dish to them. Popularly known as Nawab Bhai, he has been cooking biryani for all shooting competitions in Delhi for past 6 years. He himself is a shooter and has participated in twenty national shooting championships. Eminent shooters are fans of Nawab Bhai’s biryani. Do you know that biryani was used as a bait to make superstar Rajnikanth’s Kochadaiiyaan a success in 2013 in Bangalore? When the fans of Rajnikanth felt that the film was going to be a box office disaster, they organized a rally in Bangalore to promote the film and promised the locals free biryani for watching the film. However, biryani could not save Kochadaiiyaan from being a failure. One of the latest biryani stories is how biryani is used to motivate people for a communal work. Recently, IAS officer Prashant Nair promised platefuls of Malabar biryani to a group of people for cleaning of a 14-acre lake in Kozhikode, Kerala. Removing water hyacinth from the lake was a herculean task, but his promise of biryani made it a success. Anything can happen over biryani in India. Marriages can be fixed or broken over biryani. In 2014 in Karnataka, a bride called off the wedding over the ruckus created by the groom party over the taste of biryani. Even the bride’s family sent 30kg of biryani to the groom’s house but it came back as the groom’s family was fond of mutton biryani. Some of the stories of biryani in India are politically interesting. You might wonder what biryani has to do with politics in India. During the parliamentarian elections in 2014, Hyderabad witnessed a boom in sales of biryani. Demand for chicken and mutton biryani was tremendously high across Hyderabad during the electoral period in 2014. Biryani is not just taken advantage of as bait or bribe. It is a pretty gift too. When Sania Mirza visited Shah Rukh Khan and Farah Khan during the shooting of Dilwale in 2015, she carried a box of Hyderabadi biryani for them. Not only India but also the United States has interesting biryani stories to tell. 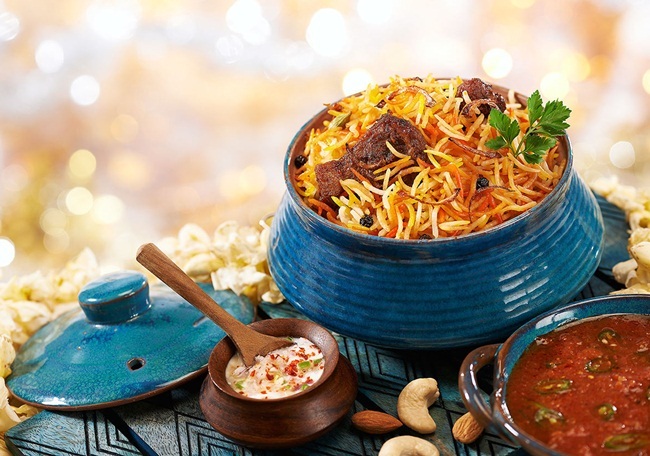 Two Indian businesses in the US – Paradise Biryani Pointe and Paradise Biryani Grill – locked their horns in a legal battle over biryani at a New Jersey court. Both of these Indian restaurants in New Jersey serve the dish. In 2011, Paradise Biryani Pointe moved the court against its rival Paradise Biryani Grill accusing the latter of infringing the former’s trademark and biryani recipe which the former claimed to have developed over 7 years. Travel Beats, a digital portal by IndianEagle, publishes interesting stories about food, culture, travel and tourist places from India, USA and Canada.